A good example of a 19th century, French, cast iron coffee mill. This piece was made by Peugeot brothers, the same company who now make cars. They started a foundry in the early 1800's making pepper and coffee mills and then turned to making cars in the late 19th century. This piece is marked, in the casting 'PEUGEOT FRERES BREVETES S.C.D.G.' and it dates from c.1880. It is also marked with a number '0' and the letter 'A'. 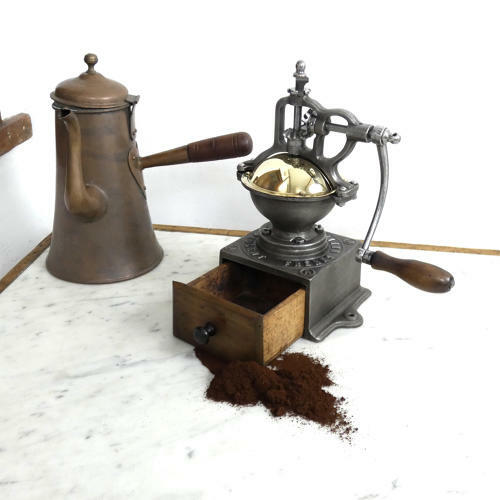 The main body of the piece is cast iron, the cover, which slides open to take the coffee beans, is brass and the draw which contains the coffee after grinding is wooden. The overall effect is very decorative as well as being practical. This example has been overhauled and is in very good condition, so it could still be used. There is a burn on the handle and a couple of worm holes in the wooden draw.